1. I have an unfair advantage: I'm a pretty fast reader. I read a ton because I enjoy it so terribly much. I remember favorite books the way most people probably remember vacations. I can check out a book for the kids that I haven't seen since elementary school and the pictures and words transport me back in time and space. I treat books like old friends -we added a custom bookshelf to our living room just so I could keep my friends in plain sight at all times. 3. I have an e-reader. I will never forget the day I first heard about the Amazon Kindle. Our pastor, Andy Stanley, was in the middle of a sermon when he went on a little tangent about this new thing he had that enabled him to keep his Bible with him all the time and also dozens of other books. I was stunned. He may as well have been telling us that man now lived on the moon for all I heard of the rest of his sermon. I spent the afternoon researching how I could get my hands on one of these Kindle things. Having an e-reader means I have multiple books at my disposal all the time without carrying around several bulky tomes. Plus I can buy digital copies of books and spend way less than traditional books or I can just use my library's website to borrow e-books. I'm currently on my 6th reader (I wear mine out and lose them like it's my job) but the Kindle Paperwhite is my very most favorite of all. I love its built-in light and the fact that it is JUST a reader. No internet shenanigans to distract me. If I pick up my Kindle, I'm reading. The End. 4. I believe anytime is a good time to read. Okay, so I don't read at the dinner table. But pretty much anywhere else is fair game. I'll throw my Kindle in my purse when I'm out running errands and pull it out if I find myself waiting in line. I'll read while I'm cooking dinner, read while I'm brushing my teeth, read while the kids are working independently on school. I don't wait until I have a large block of time to read because, well, I rarely have large blocks of time to do anything other than sleep. 5. I keep a running list of books I want to read. You know how it is, you can think of a million books you'd like to read when you have no time to read, but the day before a vacation you fall into a complete panic because you have nothing to read and no idea where to find something. Or is that just me? Well that was me before I started keeping a "Books to Read" list. I prefer keeping mine in my bullet journal, but Goodreads has a great feature for this or just keep a Note on your phone. That way, when you get a little time to read, you have good choices at your fingertips. 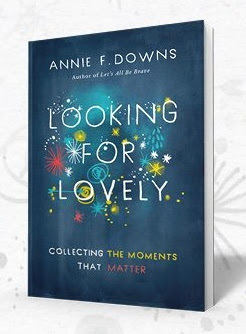 I cannot wait to get my hands on the next book on my list: Looking for Lovely by the fabulous Annie Downs. (Which is available as of today for pre-order at Amazon and all your favorite book retailers.) I like to keep my "to read" list a mix of fiction and non-fiction so I can pick something I'm in the mood for when the mood strikes. 6. I take advantage of our public library's digital system. This was a game-changer for me. When I discovered that you could check out digital books from the library (thanks to you Texas Leipprandts!) I greatly increased the amount I was reading each year. Here in Atlanta, the AFPLS (our public library system) uses Overdrive to provide a digital library to their users. All you need is a current library card to log-in and access an entire library of e-books. It's the convenience of Amazon with the free resources of your local library. No more feeling guilty about spending money on books! You can download titles to any e-reader with a few clicks and the best part - you return it with one click when you finish. If you don't bother to return it, the library wipes the book off your device when it is due back. Y'all. NO LATE FINES EVER! You can put bestsellers on hold and they'll email you when the book becomes available. I love it when I completely forget about a book I've been wanting to read and then I get a little surprise in my inbox telling me it's available. Overdrive provides digital books to over 30,000 libraries in more than 40 countries, so check to see if your local library is affiliated HERE. What do you think? Do you use any of the little tricks I mention to read more? (Is reading in the bathroom a trick?!) Do you love Annie Downs as much as I do? Girl, that is some FAST reading plus comprehension! Wow! I come from a long line of readers- When we used to have family reunions and people started to relax over the weekend, you could walk around the house and everyone was sitting around READING. Clearly John Grishams's latest best seller was good company if your brother was not. Still tops on my list: The Joy Luck Club, Donald Miller books, The Shack. I'm ashamed to say I've never read The Joy Luck Club! Maybe it needs to go on the list for this year. I am a HUGE Donald Miller fan too and yes my family sits around and reads like it's our job, even on holidays! Thanks for reading Amy.